I am so happy my busy season at work is finally over!! This means that I can finally get back to my quilting. The first thing I did was get my room all ready to go. I took out the guest bed and completely made it my room! My son was very excited because this means he got to up grade from a twin size bed to a queen size bed. Of course I had to remind him that he will have to relinquish that bed to our guests! 🙂 Needless to say I have so much more room now and I am loving it! To get back into the swing of things the first project I decided on is a little mini quilt. I joined the Small and Sweet-Mini Quilt Club and oh what cute patterns I have gotten! The first one I am doing is OhCherry! Isn’t this the cutest! The pattern is from Jacquelynne Steves and is hosted by Michele Foster. So much fun! I have also been busy starting up my own small business. Quilting is my passion and I decided to use that passion and put it into quilt products. As a quilter I know how important good product are and thought why not make my own line? Then I know I will always have quality notions and tools at my disposal! Knowing how much we quilters value our fabrics helped to inspire me to make my first product a rotary cutter! I have been using it myself for a while now and I truly do love it! I know you will too! Here is the link. I’d love for you to check it out! Until next time; happy stitching! For my day job I am a bookkeeper and tax preparer. Tax season is a crazy busy time that steals my energy and mutes my creativity! Needless to say I have not sat down at my sewing machine since January 4th and I am really really missing it!! I knit a lot and do a bit of hand embroidery during the tax season but I have been missing the colors and feel of fabric! My next solution? ENGLISH PAPER PIECING! YES!! I do enjoy hand sewing so why not give it a try. It’s nice because I can watch movies and spend time with my hubby and son and still be in my creative zone. I found a class on Craftsy. I am a HUGE Craftsy fan. I signed up for Quick and Easy English Paper Piecing with Helen Stubbings. It’s a great class so far. She has a great way of teaching and I love her accent! 🙂 There are so many neat things being done with EPP. I am especially fond of the Millefiori Quilt-La Passacaglia. WOW! These quilts are unbelievable! Once I master the art of EPP I will definitely be diving into one of these! The class gives you a shopping list for all kinds of fun goodies! Here is my new EPP stash of fun stuff! I have my next set basted and maybe tonight after work I will feel up to doing some stitching! I can’t believe we are halfway through January already! I’ve been thinking back to my 2015 year of quilting and crafts. It was a great year for learning and stepping out of my comfort zone. I joined several Facebook quilt-a-longs. I really love the support and inspiration that you can get from an online group. I even finished my first full size paper piecing quilt top! It is Harry Potter themed and the pattern comes from a wonderful site called Fandom in Stitches. This project was so much fun. I was brand new to paper piecing and when I completed the top I felt so proud! Now my goal for 2016 is to get it quilted. I also took 2 classes at a local quilt shop. I learned how to machine applique; which I LOVE and I also took a class and started to learn how to free motion quilt on my home machine…which I LOVE but have A LOT more to learn! The classes were a lot of fun. I made a Christmas table runner and actually finished it in time for the holidays! It was simple but it was cute and I was happy with it. My friends that know me know that I have a habit of starting MANY projects and finishing a FEW! I just get so excited for everything and want to do it all at once haha! Of course there are many more projects I am still working on but I am pretty happy with my 2015 stuff! I learned knew techniques, met knew people, and fell in love with quilting even more! Oh…and I added quite a lot of awesome fabric to my stash! Happy New Year to all. I am looking forward to what 2016 will bring! Learning to quilt has been an amazing journey! About two years ago I decided I was going to jump head first into the world of quilting. It has been such a fun learning experience! From figuring out how the heck to work my sewing machine to what do you mean now it has to be quilted?! I have made great strides in my endeavor! I am creating this blog as my quilting journal. To share with all of you the good the bad and the it’s crooked and not lined up now where the heck is my seam ripper moments! 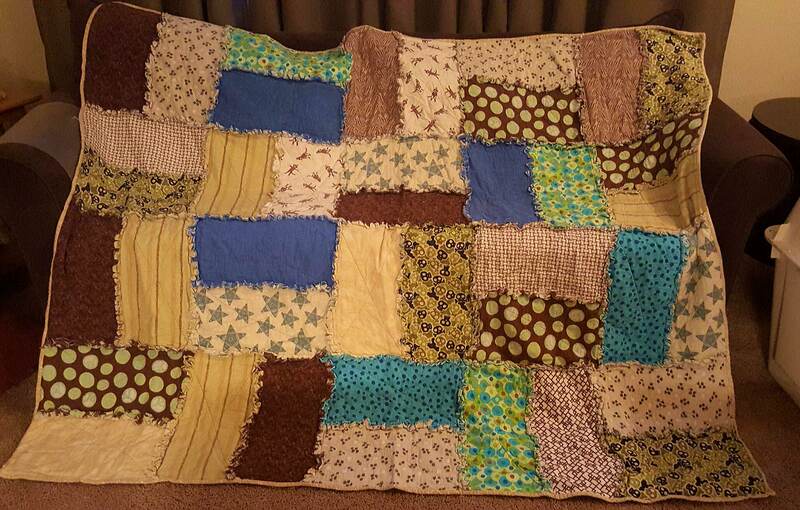 My first project I made was a rag quilt for my hubby. I loved that it was quilt as you go! It was a very fulfilling beginner project. I enjoyed the process of picking my flannel fabrics and arranging them just so. My only complaint was snipping those edges at the end. OH MY! I now am the proud owner of an accuquilt die cutting machine along with the rag square die! I am new to blogging so please be patient with me as I build my site and learn new ways to awe and inspire! dezertsuz on 2015 Proudest Moments….